The third generation crypto economy is in full launch mode and it seems every day we are inundated with announcements. Each promises to change the world, move markets, and launch with new technology. Roadmaps are made into graphics and the ICOs launch with many promises. CanYa.io is taking what seems to be a unique, more old-school approach to the new ICO fundraising market. CanYa.io is using the Etehreum blockchain technology to launch an ERC-20 token call CanYa Coins (CAN) to fund the expansion of an existing successful project. The dev team is made up of several former Australian Air Force pilots and crypto experts with a sprinkling of marketing and job market types working on a project in which they invested their own money to launch. In this respect CanYa.io seems unique to be launching an ICO not to promise a product, future success and grand dreams of profit but rather to expand a product already proven to work. EOS is another ERC-20 token who promises vertical and horizontal scaling of decentralized applications. A re-invention of Ethereum only better according to the dev team. Market Cap $4.6 billion for a company trying to do similar things to Etehreum. Qtum has a similar description in a blockchain for smart contracts and decentralized apps. Market cap $2.1 billion. Tron (TRX) is the coin developed for the entertainment business and saw a 100% gain today to a market cap of $2.4 billion. Non-tech types have no idea what these companies do and the companies yet do not have a working product or monetization and are worth billions. CanYa.io is looking to flip the script and launch with a working product that normal people understand and hopes millions will use. CanYa estimates the worldwide services market to top $2 trillion and hopes to capture even a fraction of that revenue. CanYa takes its name from a way of asking a question. Can ya fix my leaking tub? Can ya babysit my kids? Can ya mow the lawn? It allows people looking for services from manual labor to technical programming to log in and service for people selling services. Prices and availability are listed and include pictures, descriptions and locations. The entire network is peer-to-peer and requires no middle-man. 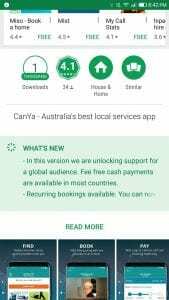 Soft launched 2016 in Australia, CanYa already has an app on the Google playstore and iTunes with thousands of downloads. It is currently on version 2.3 indicating is has had many revisions and development since launch. We used Sydney to check out the apps and listings for this article. There were 100’s of services listed with popular listings for babysitters, electricians, handymen, HVAC, painters, mechanics, and house cleaners. Much like social media, each listing requires a profile picture of the actual person offering services for sale. Creating an account was easy and only took a few minutes. We then were able to create a listing for a service and after searching the available listings chose “dangerous animal handler”. We created the listing and posted it to the Sydney market. Luckily we had no competition and received an inquiry within 5 minutes to wrestle a crocodile. We declined. CanYa.io does have a roadmap but luckily the product is available and can be verified working now. Anyone interested in investing can head over to Google or iTunes to download. Check out the Whitepaper and head over to BitcoinTalk CanYa forum and Telegram for up to date information. The project launched in 2015 and has been under development without only grass-roots marketing until just recently. Despite no marketing they have managed to get the word out and now boast 51,000 Facebook Likes and 2600 Telegram members. CanYa.io is taking a unique approach in the ICO space after spending two years in development and not asking for fund raising until they had a working product with proof of concept. They have 8000 active users and 4000 services with an app downloaded thousands of times. The roll-out is set to start 3 months after the close of the ICO meaning those who choose to invest will not be waiting long to huge news from the team. We have seen recently with Ripple (XRP) and Stellar (XLM) what news can do to a coin price with both experiencing 100%+ gains seemingly overnight. Is Stellar or Ripple going to Land the Middle East Central Banks? The ICO is limited to 60 million CanYa coins from a total of 100 million CAN in circulation. The dev team will maintain 20% under time lock with 20% allocated to a reward pool. The team hopes to raise 29,333 ETH through the ICO process in a typical scale of offering a decreasing amount of CAN for ETH, BTC, LTC, or Dash as the ICO progresses. 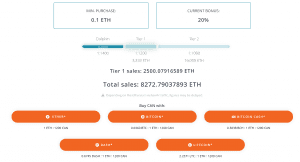 The current tier is 1 ETH to 1200 CAN and can be accessed here or by clicking the image below. The initial coin offering market is rife with landmines and scam coins. Most offer roadmaps, whitepapers and lofty goals only to fall behind or provide no updates following fundraising. CanYa.io is looking to raise funds with a currently active product with expanding user base. It hopes to become an Uber type experience for the services industry and expand from the limited release. It will integrate the CanYa coin as a form of payment in 2018 and fully decentralize in 2019. It is part of the third generation blockchain economy based on the Ethereum smart contract technology. Any investment comes with risk so please do your research, check out the app (iTunes or Google), website, whitepaper, BitcoinTalk forum and Telegram. The ICO which started November 26 is set to run for 30 days. Following the ICO news is going to come quickly as the broader launch is set for March 2018. As we have seen with Ripple (XRP), Stellar (XLM), NEO, Qtum, Tron and many other third generation crypto companies news could push this company to the moon very quickly. The ICO may be your last chance to get in before blast off.